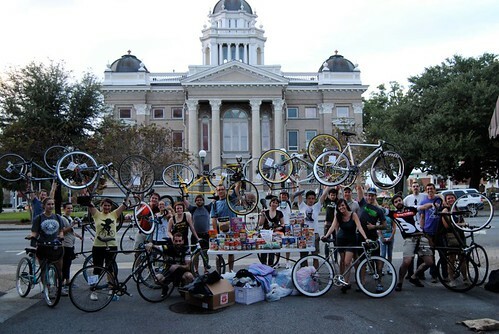 A group of local cyclists collected over 60 food items and over 200 clothing items while riding in the Plymouth Rock-n-Ride Charity Bicycle Ride on Sunday November 20th. 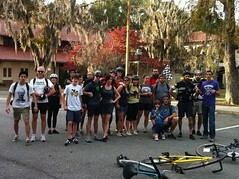 The cyclists rode to various checkpoints throughout Valdosta featuring different challenges to be completed. 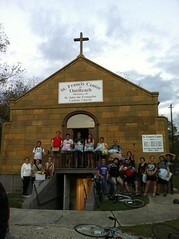 The group also visited grocery store checkpoints to buy a variety of food items for a local charity. The riders then delivered the food and clothing donations to the Saint Francis Center Ministry Outreach program on Mary Street. Prizes from local sponsors (Red Door Records, Western Auto, Valdosta Bike Center and Salem Records) were awarded to the 1st, 2nd, 9th, and 13th place finishers in the ride. 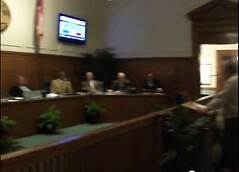 Courtesy of the camera of George Rhynes, here are the Citizens to Be Heard at Thursday's Valdosta City Council meeting. Most of them are frequent cyclists, with a surprise ally speaking first. OK, Ken wasn't talking about bicycles, but the next one doesn't make sense without Ken's talk. Bicycles are going to be a big part of our future. Gas prices, and a lot of folks getting their licenses suspended, having to walk.... And if you don't have a bicycle, that's the only choice you have. Matt Portwood told Thursday's Valdosta City Council meeting that since his last address to the Council was so well received this time he brought friends (such as Heather Evans, who had just spoken) and an ally in the front row ( Roy Taylor, who spoke first) This time he asked for bike racks. If City Hall had one outside, their bicycles wouldn't have been locked to the front step railing. Heather Evans provided a petition with more than 200 signatures, and told Thursday's Valdosta City Council meeting she got requests frequently while working in community service for something to be done about non-automobile transportation. She presented a variety of evidence. Ideally, I'd like to see bike lanes all over town. But if I had to pick one to start with, St. Augustine would be my choice. I choose this road because it also needs to have a completed sidewalk segment. I can't tell you how many people including myself have been endangered while using this portion of road. When he spoke in Thursday's Valdosta City Council meeting, George Rhynes mentioned he had videoed the bicycles he found out front. We need bicycle paths in this community, very very badly. I travel to Europe... and they have bicycle paths all over, and it helps our children as they are growing up. It helps us as adults.... It helps all of us.... It is good for our children, our community. You have a grant in here now of about $75,000 to $100,000 ... school money. I can think of no finer way for those children than to walk the sidewalk and to ride a bicycle. Ride your bicycle, have to show a drivers' license, get your camera stolen by police? Not in Atlanta any longer! That's Copwatch of East Atlanta; here's their press release, including video of the incident. 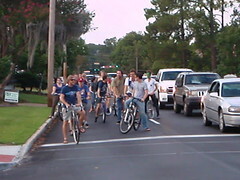 Critical Mass is a monthly bicycle ride to celebrate cycling and to assert cyclists' legal right to the roads in Valdosta.